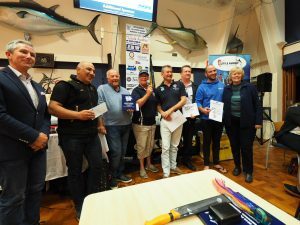 The Annual Peter Goadby Memorial Tournament presented by Little Audrey Charters and hosted by the Sydney Game Fishing Club over the 28th and 29th April 2018 out of their iconic game fishing club at Watsons Bay on Sydney Harbour. 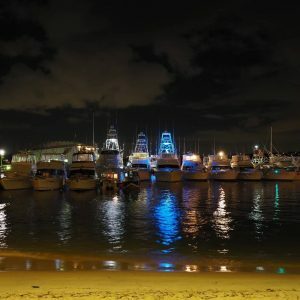 Despite average weather conditions the fishing was on point with tags and captures of blue and striped marlin, big yellowfin tuna, spearfish, sharks and even the odd dolphin fish being recorded. 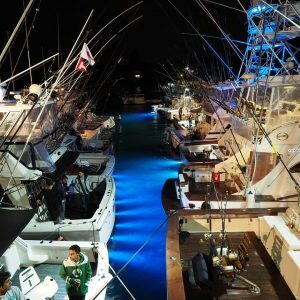 Over the two days of fishing the fleet of thirty boats raised a total of 104 fish, with 76 being fought and 29 being tagged or captured. The fish weren’t small either with multiple yellowfin over 150lbs being taken, as well as a number of blues in excess of 350lb. 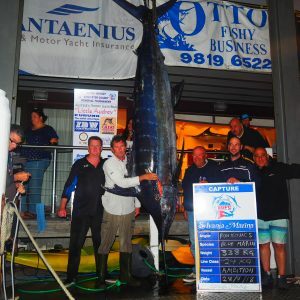 Congratulations to Elly Offord fishing in the Junior (female) category on board Cookie, skippered by Murray Offord, who caught a 372lb blue marlin on 130lb tackle and to Ron Kovacs fishing in the Male category onboard Ambition, skippered by Ivan Bennet, who caught a 744lb blue marlin on 50lb tackle. Both of these fish are pending Australian and New South Wales records and are a testament to the quality of fish that can be found off Sydney each year in April. Sydney Game Fishing Club would like extend a warm thank you to all those who entered the tournament and have supported the event. The club would also like to thank the many sponsors who made the event possible, in particular our major tournament sponsors – Little Audrey Charters, IBW Constructions, Furuno Electronics, Great Norther Brewing Co, Sylvania Marina and Tonic Eyewear.